The Hasty Pudding Theatricals has presented its unique brand of student-written theater every year since 1844, making it the third oldest theater organization in the world as well as a beloved Harvard tradition. 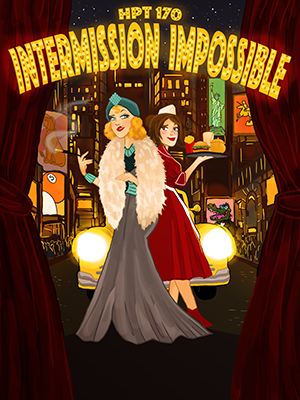 Join us on our New York tour to catch these dames putting the broad in Broadway in HPT 170: Intermission Impossible. Places, everyone! World War II is over, New York is booming, and alcoholic playwright TENNESSEE WHISKEY is making his Broadway debut. After aging actress FAYE DINAWAY is deemed too old for her role, struggling deli waitress MEGAN ITBIG gets her chance to audition. But when America’s sweetheart and ditzy pageant queen AMBER WAVESOFGRAIN lands the lead, Megan teams up with Faye to reclaim the spotlight. Will hunky sailor SAL PACIFIC find his first mate, or will he stay at half mast? Will cranky Southern matron AUNTIE BELLUM learn to accept the “alternative lifestyle” of her nephew Tennessee? Will Shakespearean director TOBY ORNOTTOBErealize his vision, or will it turn into a comedy of errors? Can no-nonsense taxi driver HAILEY CAB learn that all’s fare in love and war? Will it ever be explained why RICKEY RAT can talk? Catch these dames putting the broad in Broadway. This year’s writers are Shaun Gohel ’18 and Mike Skerrett ’18.